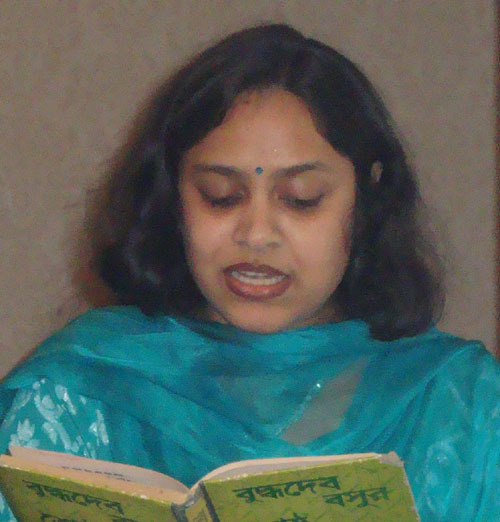 Naznin Seamon (নাজনীন সীমন) is the award winning poet and a short story writer of the 90s. She has been living in New York since 1997 where she went to LaGuardia Community College for her Associate Degree and to Queens College for Bachelor and Master's Degrees in English. She is now a High School English teacher working for the NYC Department of Education. Ms. Seamon's first short story was published in Jignasha, edited by Sibnarayan Ray. She also contributed to a number of well known literary supplements such as The Daily Jugantor, The Daily Ittefaq, The Daily Ajker Kagoj and The Weekly Robber. She is a regular contributor to Shabdaguchha and the Secretary of the Forum for Secular Bangladesh (Ghatok Dalal Nirmul Committee), New York Chapter. She was interviewed by Voice of America Bangla Radio and Ekushey TV. Naznin Seamon is also the editor of a online news paper, NYnews52.com. Naznin Seamon was born in Jessore, Bangladesh. But she spent her early life in Chittagong, the port city, where her father, Mr. Naimur Rahman, was the assistant director for Board of Investment of the Government of Bangladesh. Before moving to Chittogong, however, she lived in many different cities of the country, such as Potuakahli, Khulna, Barisal, and Bogura with her family due to her father's posting. In Chittagong, she graduated from Agrabad Govt. Colony High School, while she finished her two years of college from Hazi Mohammed Mohsin College. Later, she moved to the capital of the country, Dhaka, and studied at the Eden College to earnd her bachalor degree in Business. She graduated from Eden College in 1997 prerior migrating to the United States. Since her childhood, she was engaged in various cultural activities such as taking lessons in music, dance and poetry recitals. She also perticipated in radio musical program from Chittagong Radio Station as a young artist and received various prizes. She published her first poem in an wall-magazine, Journal, at the age of 10. 1.Aditonto Bistirnoter Dhaley (আদিগন্ত বিস্তীর্ণতার ঢালে), Shabdaguchha Press, Dhaka-New York, 2000; 2nd edition: 2004.